Tooth discolouration can be a result of either extrinsic (surface stain) or intrinsic (internal stain) factors. 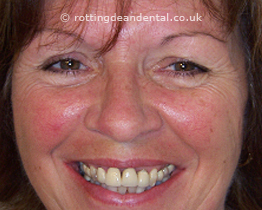 As a general rule our teeth become darker as we become older – it is part of the normal ageing process. The deciduous or milk teeth have a much whiter appearance than their permanent successors. Many people would prefer their teeth to be whiter and so look at various whitening and whitening options. Whitening is the use of chemical agents to produce an oxidation of the discolouring molecules within the tooth. It is not a temporary process. A dentist using chemical agents can also remove superficial stains such as tobacco, tea and coffee. Dentists can bleach teeth externally by applying a whitening product containing peroxides (usually hydrogen peroxide or carbamide peroxide). It can either be done at the dental surgery or by the patient at home (under the dentist's direction). At-home systems contain lower concentrations of peroxide, usually 3.5 percent. The dentist takes an impression of the teeth to produce a custom-made tray that covers the teeth to be bleached. The tray will hold the whitening gel against the teeth with minimal contact with the gums and other oral tissues. The tray is worn for several hours, usually at night time or when it is most convenient. A course of treatment usually takes two to three weeks. Possible side effects include minor sensitivity of the teeth to heat and cold. These symptoms are usually mild and will quickly ease when the treatment ends. When a tooth is discoloured following the death of the pulp, the dentist can carry out internal whitening after the completion of root canal treatment for the tooth. The whitening agent is sealed inside the tooth for about a week. 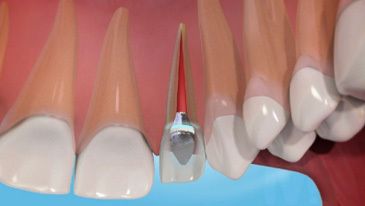 It is cleaned out when satisfactory lightening is achieved and a tooth-coloured filling is placed inside the tooth. A very effective method is to combine internal and external whitening. Internal and external whitening is used to lighten dead (non-vital) root-filled teeth. 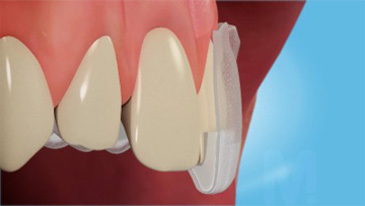 The procedure involves putting gel inside the tooth by holding the gel inside a mouthguard. It produces very good results. Teeth with a yellowish hue usually bleach well, brownish ones less so; greyish teeth may not bleach well at all. 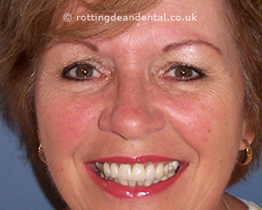 Discoloured fillings will not improve with whitening. They will show more if the surrounding tooth structure is bleached and they may have to be replaced. The dentist will be able to tell if whitening is suitable, or not, and discuss other options such as veneers and crowns for improving the appearance of the teeth.